Download "Fitzgerald Murraine. Enclosures. RE: Certification as SDBE, MBE, FBE and DLSB in the New PEP. 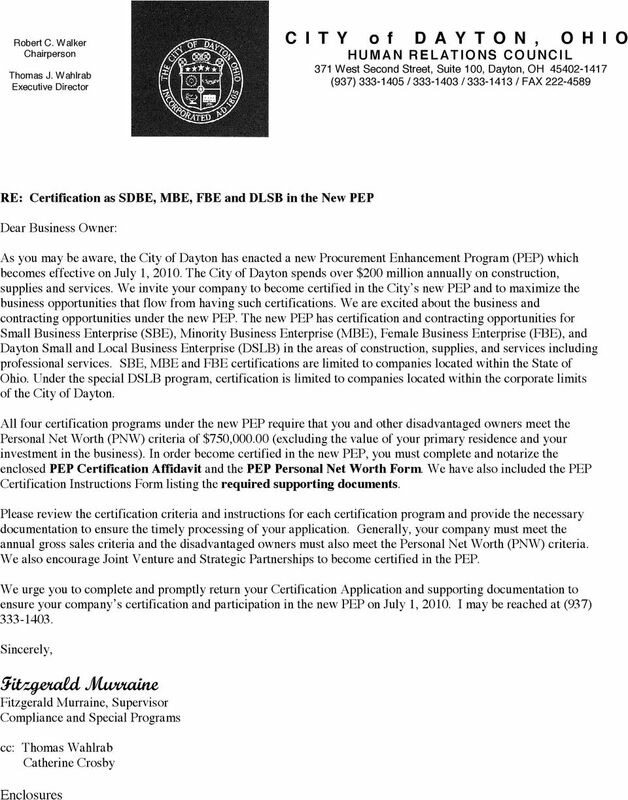 Dear Business Owner:"
2 City of Dayton Procurement Enhancement Program (PEP) Certification Application Instructions Thank you for your interest in becoming a certified SBE, MBE, FBE, Dayton Local Small Business or HUD Section 3 company with the City of Dayton PEP. 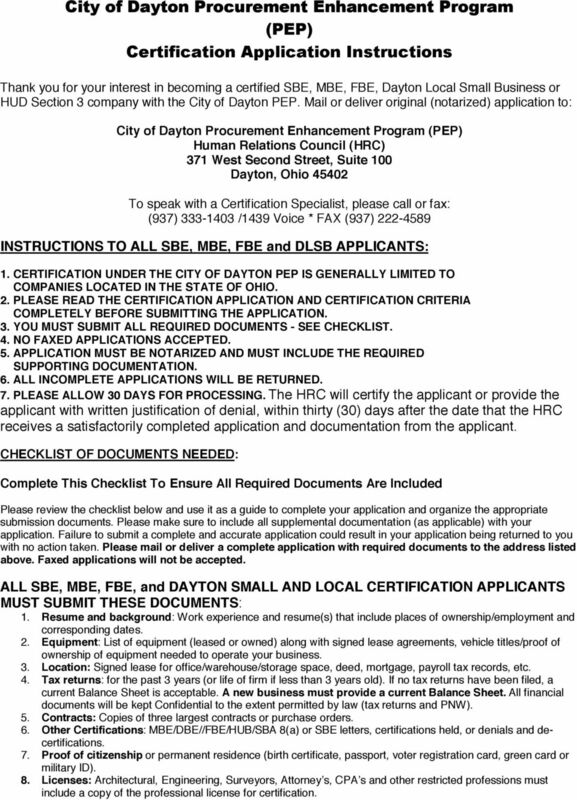 Mail or deliver original (notarized) application to: City of Dayton Procurement Enhancement Program (PEP) Human Relations Council (HRC) 371 West Second Street, Suite 100 Dayton, Ohio To speak with a Certification Specialist, please call or fax: (937) /1439 Voice * FAX (937) INSTRUCTIONS TO ALL SBE, MBE, FBE and DLSB APPLICANTS: 1. 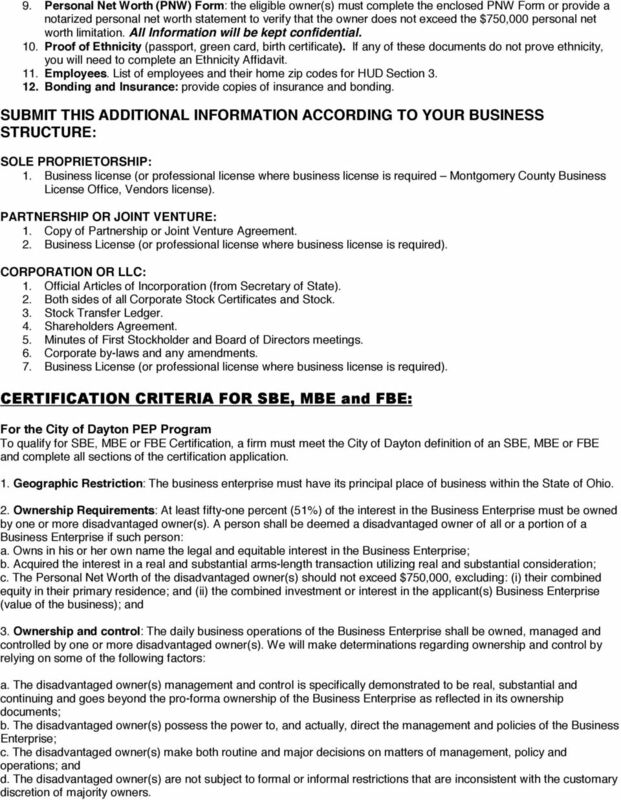 CERTIFICATION UNDER THE CITY OF DAYTON PEP IS GENERALLY LIMITED TO COMPANIES LOCATED IN THE STATE OF OHIO. 2. PLEASE READ THE CERTIFICATION APPLICATION AND CERTIFICATION CRITERIA COMPLETELY BEFORE SUBMITTING THE APPLICATION. 3. YOU MUST SUBMIT ALL REQUIRED DOCUMENTS - SEE CHECKLIST. 4. NO FAXED APPLICATIONS ACCEPTED. 5. APPLICATION MUST BE NOTARIZED AND MUST INCLUDE THE REQUIRED SUPPORTING DOCUMENTATION. 6. ALL INCOMPLETE APPLICATIONS WILL BE RETURNED. 7. PLEASE ALLOW 30 DAYS FOR PROCESSING. 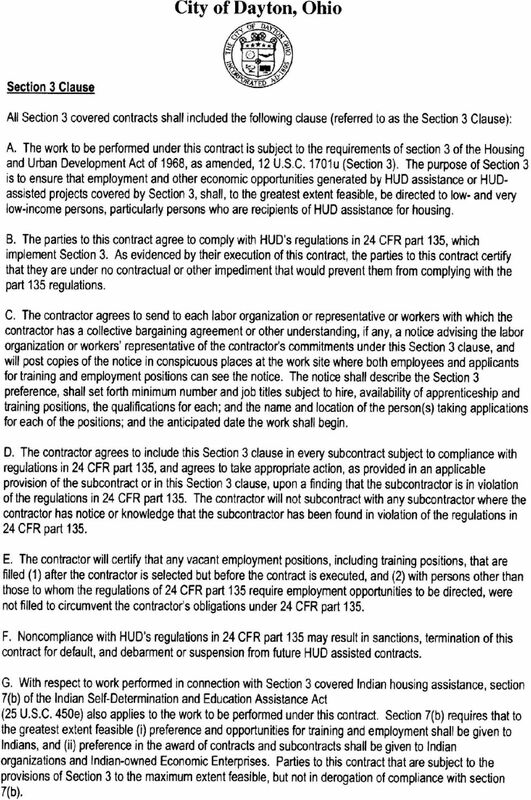 The HRC will certify the applicant or provide the applicant with written justification of denial, within thirty (30) days after the date that the HRC receives a satisfactorily completed application and documentation from the applicant. CHECKLIST OF DOCUMENTS NEEDED: Complete This Checklist To Ensure All Required Documents Are Included Please review the checklist below and use it as a guide to complete your application and organize the appropriate submission documents. Please make sure to include all supplemental documentation (as applicable) with your application. Failure to submit a complete and accurate application could result in your application being returned to you with no action taken. Please mail or deliver a complete application with required documents to the address listed above. Faxed applications will not be accepted. ALL SBE, MBE, FBE, and DAYTON SMALL AND LOCAL CERTIFICATION APPLICANTS MUST SUBMIT THESE DOCUMENTS: 1. Resume and background: Work experience and resume(s) that include places of ownership/employment and corresponding dates. 2. Equipment: List of equipment (leased or owned) along with signed lease agreements, vehicle titles/proof of ownership of equipment needed to operate your business. 3. Location: Signed lease for office/warehouse/storage space, deed, mortgage, payroll tax records, etc. 4. Tax returns: for the past 3 years (or life of firm if less than 3 years old). If no tax returns have been filed, a current Balance Sheet is acceptable. A new business must provide a current Balance Sheet. All financial documents will be kept Confidential to the extent permitted by law (tax returns and PNW). 5. Contracts: Copies of three largest contracts or purchase orders. 6. Other Certifications: MBE/DBE//FBE/HUB/SBA 8(a) or SBE letters, certifications held, or denials and decertifications. 7. Proof of citizenship or permanent residence (birth certificate, passport, voter registration card, green card or military ID). 8. Licenses: Architectural, Engineering, Surveyors, Attorney s, CPA s and other restricted professions must include a copy of the professional license for certification. 3 9. 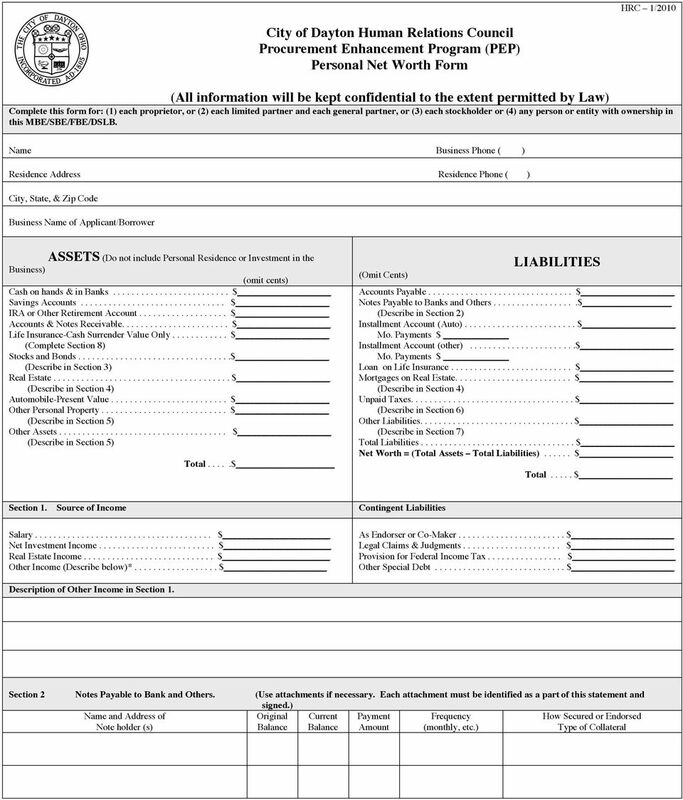 Personal Net Worth (PNW) Form: the eligible owner(s) must complete the enclosed PNW Form or provide a notarized personal net worth statement to verify that the owner does not exceed the $750,000 personal net worth limitation. All Information will be kept confidential. 10. Proof of Ethnicity (passport, green card, birth certificate). If any of these documents do not prove ethnicity, you will need to complete an Ethnicity Affidavit. 11. Employees. List of employees and their home zip codes for HUD Section Bonding and Insurance: provide copies of insurance and bonding. SUBMIT THIS ADDITIONAL INFORMATION ACCORDING TO YOUR BUSINESS STRUCTURE: SOLE PROPRIETORSHIP: 1. Business license (or professional license where business license is required Montgomery County Business License Office, Vendors license). PARTNERSHIP OR JOINT VENTURE: 1. 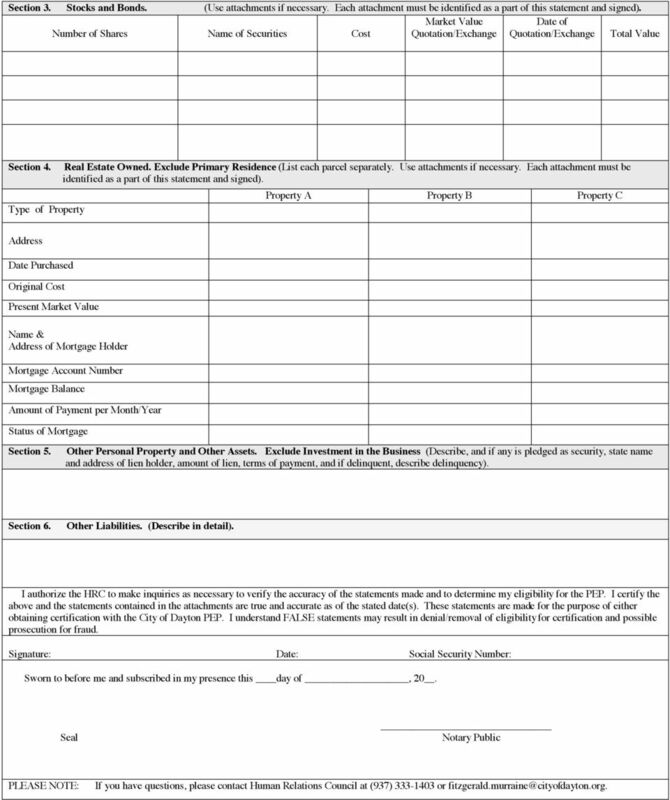 Copy of Partnership or Joint Venture Agreement. 2. Business License (or professional license where business license is required). CORPORATION OR LLC: 1. 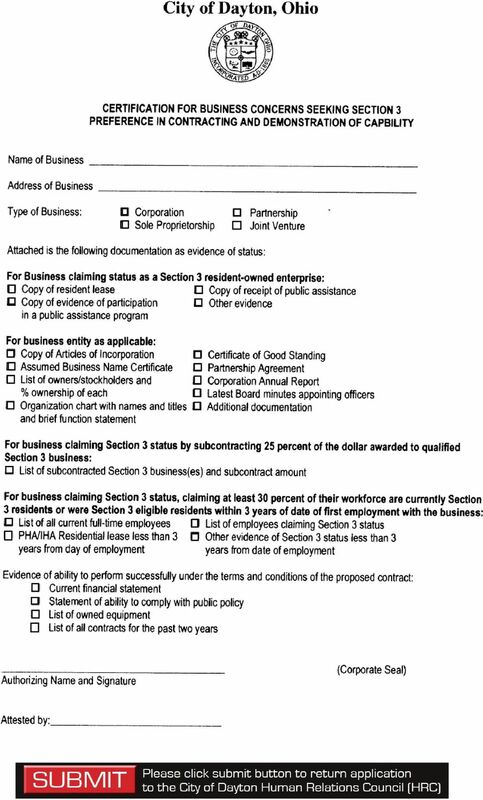 Official Articles of Incorporation (from Secretary of State). 2. Both sides of all Corporate Stock Certificates and Stock. 3. Stock Transfer Ledger. 4. Shareholders Agreement. 5. Minutes of First Stockholder and Board of Directors meetings. 6. Corporate by-laws and any amendments. 7. Business License (or professional license where business license is required). 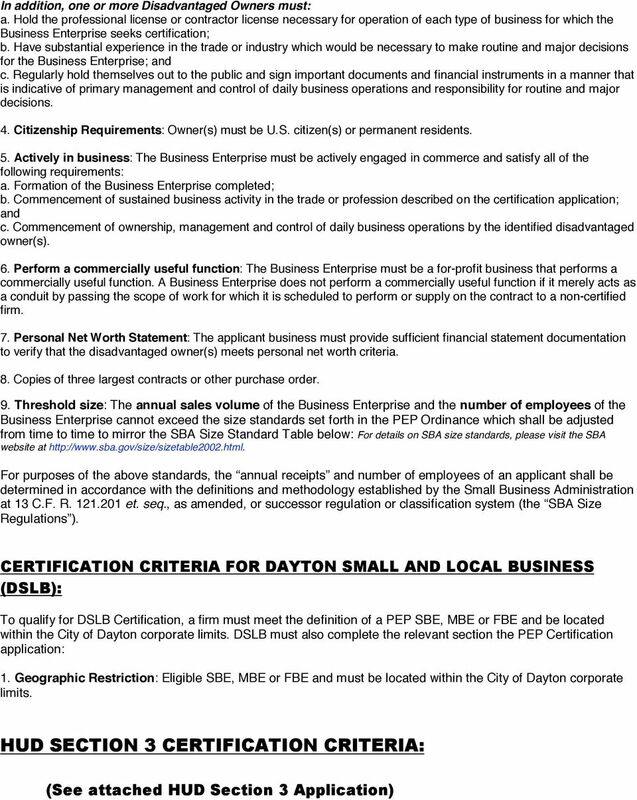 CERTIFICATION CRITERIA FOR SBE, MBE and FBE: For the City of Dayton PEP Program To qualify for SBE, MBE or FBE Certification, a firm must meet the City of Dayton definition of an SBE, MBE or FBE and complete all sections of the certification application. 1. Geographic Restriction: The business enterprise must have its principal place of business within the State of Ohio. 2. Ownership Requirements: At least fifty-one percent (51%) of the interest in the Business Enterprise must be owned by one or more disadvantaged owner(s). A person shall be deemed a disadvantaged owner of all or a portion of a Business Enterprise if such person: a. Owns in his or her own name the legal and equitable interest in the Business Enterprise; b. Acquired the interest in a real and substantial arms-length transaction utilizing real and substantial consideration; c. The Personal Net Worth of the disadvantaged owner(s) should not exceed $750,000, excluding: (i) their combined equity in their primary residence; and (ii) the combined investment or interest in the applicant(s) Business Enterprise (value of the business); and 3. Ownership and control: The daily business operations of the Business Enterprise shall be owned, managed and controlled by one or more disadvantaged owner(s). We will make determinations regarding ownership and control by relying on some of the following factors: a. The disadvantaged owner(s) management and control is specifically demonstrated to be real, substantial and continuing and goes beyond the pro-forma ownership of the Business Enterprise as reflected in its ownership documents; b. The disadvantaged owner(s) possess the power to, and actually, direct the management and policies of the Business Enterprise; c. The disadvantaged owner(s) make both routine and major decisions on matters of management, policy and operations; and d. The disadvantaged owner(s) are not subject to formal or informal restrictions that are inconsistent with the customary discretion of majority owners. 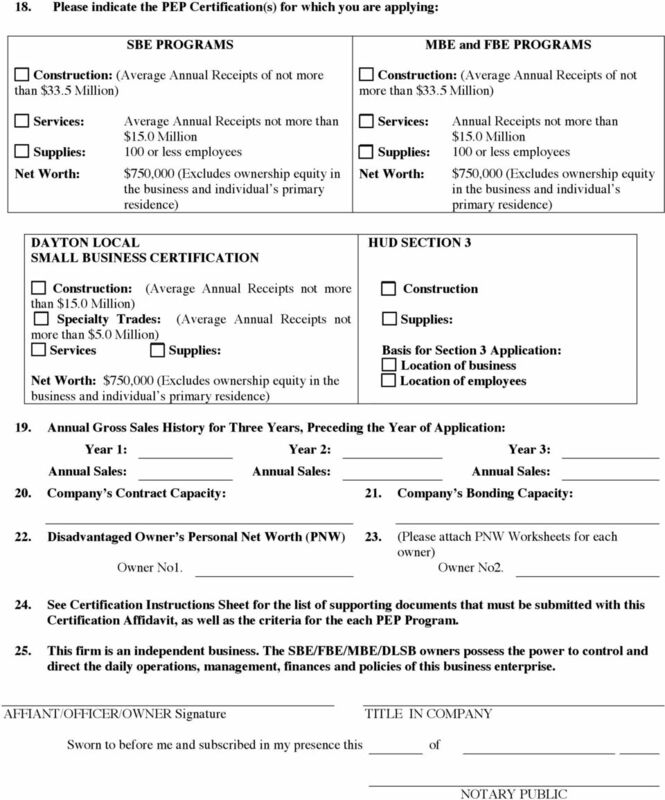 Owner Eligibility Requirements are the same for all business structures. One document must be a photo I.D. for identity verification purposes. 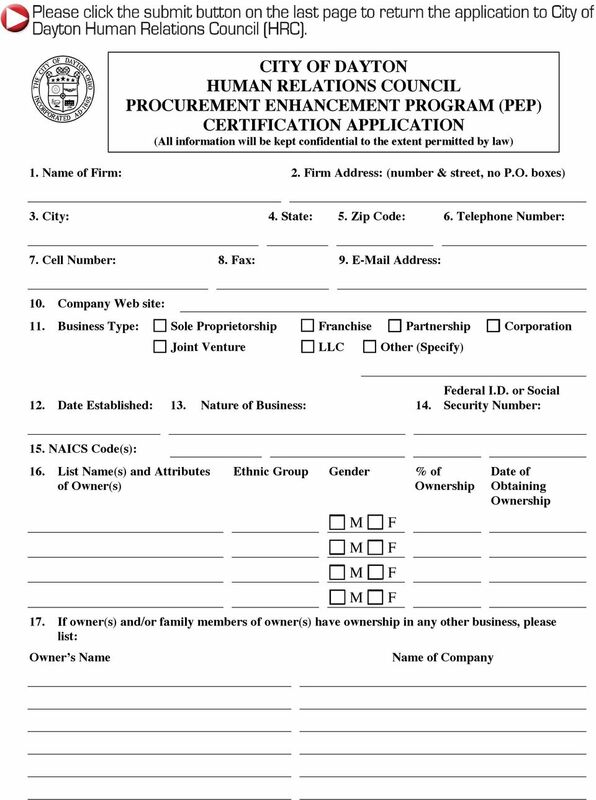 About Certification Many corporations, especially those in the National Minority Supplier Development Council Network, have special programs designed to assist minority owned firms to meet with their needs. Important! Please read carefully before beginning your Standard Verification application.